If you’ve used a Mac, you obviously know all about Spotlight. The built-in search utility in macOS is quite possibly the best way to find your way around a Mac. It comes packed with a number of cool features, and tricks. However, when it comes to high level productivity, nothing can beat Alfred (and Batman can vouch for that). Alfred is a Spotlight replacement for Mac, that will let you enjoy a lot more customizability, along with added functionality. However, what makes Alfred way better than Spotlight, is a neat little feature called “Alfred Workflows”, which is only available with the Powerpack purchase. Note: For people unaware, install workflows on Alfred is very easy. You can simply download the workflows from the links and just click on them to install them. I’ve tested these Workflows on a MacBook Air running macOS Sierra 10.12.4 Developer Beta. The experience should be similar for other versions of macOS, as well. I’m sure there have been a lot of situations where you just needed an email account to receive a couple of emails from someone you never want to hear from again. In such cases, a temporary email ID can come in handy. 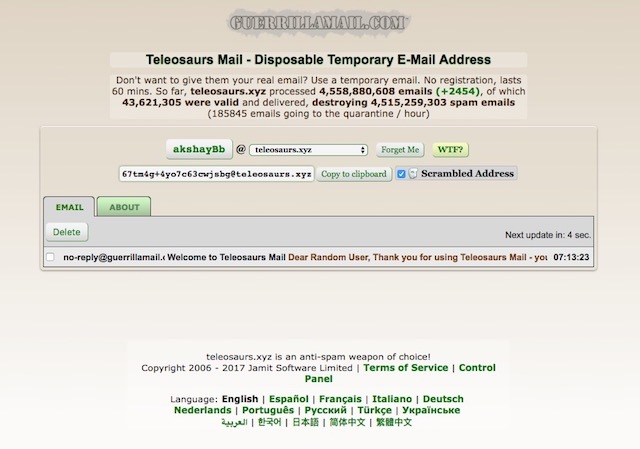 Fortunately, Alfred has a neat workflow that can let you create a temporary email ID in no time, with the service “Teleosaurs“. Once you have added the workflow to Alfred, you can simply launch Alfred, and type “tmpmail” followed by the email ID you want. Alfred will automatically create the inbox for you, open it in a new tab in Chrome, and copy the email to your clipboard, so you can easily share it. Note: The workflow only works if your browser is in the foreground when you run the workflow. Another really useful workflow that you can use in Alfred, is the WiFi toggle workflow. This workflow will let you quickly toggle your Mac’s WiFi radio, simply by typing “WiFi” in Alfred. You can simply launch Alfred, and type “WiFi”. This will automatically toggle the status of your WiFi radio between on/off. If you’re like me, you have a huge list of bookmarks in Chrome, and reading through them to find the one you’re looking for can be quite a challenge. Fortunately, an Alfred workflow can quickly remedy this. With the “Chrome Bookmarks” workflow, you can easily use Alfred to look through your entire list of Chrome Bookmarks, in much the same way as you would search for files. You can simply launch Alfred, type in “,b” (which is the keyword), and start typing the name of the bookmark you’re looking for. Alfred updates the list in real time, and you can simply select the one you want to go to. You can also use Alfred to tweet directly from within Alfred, without having to launch the Twitter app or website. The workflow will also let you follow new people, block people, search for mentions, and do a lot more. Once you have the workflow, simply launch Alfred, and type “alfredtweet” to authenticate Alfred with your Twitter account. This is just a one time set up. Afterwards, you can use “tweet” followed by your tweet to send a tweet to your Twitter timeline directly from Alfred. The Alfred window shows a handy character count, as well, so you don’t overshoot the 140 character limit that Twitter imposes on every tweet. You may be aware that Macs come with a handy Terminal utility called “caffeine”, which basically lets you set a time that your Mac won’t sleep for. This can come in very handy. However, if you can do it with just a keyword in Alfred, why even launch Terminal? In Alfred, just type “caff“, and you’ll be shown the current state of “Caffeinate”, along with options to configure, or enable it. Alfred workflows can also let you quickly search through Reddits (and subreddits), without having to launch your browser just to look for a couple of things. The Reddit workflow in Alfred, can easily let me look up threads in subreddits, which comes in quite handy. Simply launch Alfred, and type “r/“, which will make Alfred ready to search through Reddit for you. You can type the name of a subreddit in Alfred, and Alfred will then start displaying the hottest threads in the subreddit. If you’re a programmer, chances are, you visit Stack Overflow more than once a day, looking for solutions to some problem that you’re facing. Alfred makes this incredibly easy. With a workflow called “StackOverflow Search”, you can easily search for questions on Stack Overflow. Simply launch Alfred, and type “.so” to start Alfred searching for questions on Stack Overflow. You can then start searching for the question on Stack Overflow. Alfred updates the results in real time, and you can simply select the question most relevant to your query, to open it in your default browser. If you’re a graphic designer, a website designer, or basically a designer of any sort, you’d know the pain of constantly having to convert color codes to a different format. Alfred can help you here, as well. You can simply use the “Colors” workflow to convert colors to multiple formats. Simply launch Alfred, and type one of the keywords to convert the color code. If you want to convert codes from HEX values, use “#”. Some other keywords that you can use are “rgb”, “hsl”, “c”. Type the color code (or values), and Alfred will update the results in real time to show you the converted values in the results itself. Another useful workflow that you can use, is the “Record Sound” workflow, which directly starts a new QuickTime audio recording. 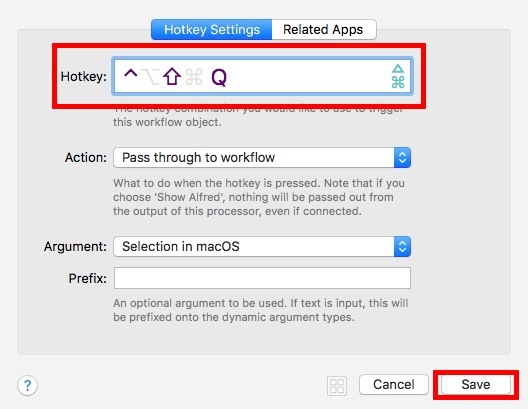 This workflow saves you a couple of clicks, and the trouble of having to launch QuickTime. Simply launch Alfred, and type “record audio” – This is the keyword for the workflow. When you hit enter, Alfred will start an audio recording directly. You don’t even have to click on the record button. 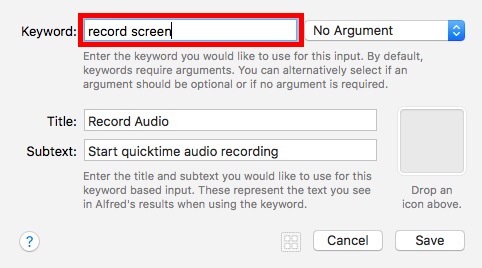 If you find yourself recording your Mac’s screen more often than recording audio, you can easily tweak this Workflow to start a screen recording, instead. Open Alfred Preferences, and go to Workflows. Here, select “Audio Recording” from the column on the left. Double click on “Run NSAppleScript“. Here, edit the line that reads “set new_recording to new audio recording“, to “set new_recording to new screen recording“, and click on “Save”. 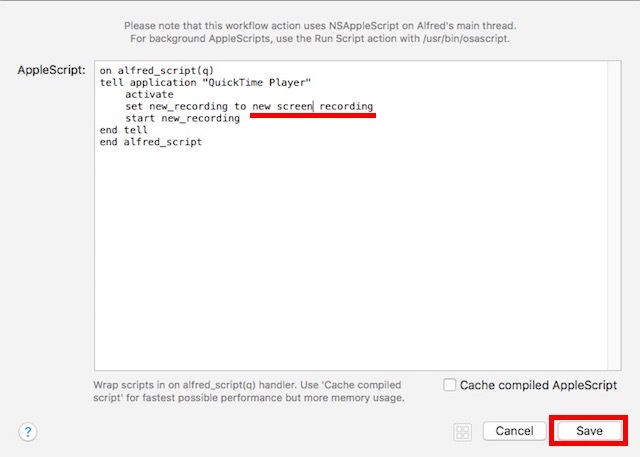 Now, whenever you launch Alfred, and type “record screen”, it will automatically start recording your Mac’s screen. 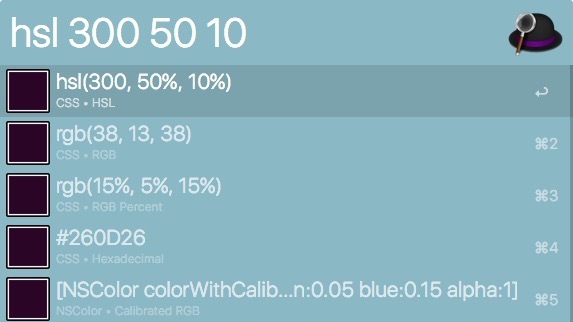 Using a workflow called “Display Brightness”, you can set the brightness value of your display to a particular percentage value. Simply launch Alfred, and type the keyword “brightness”. 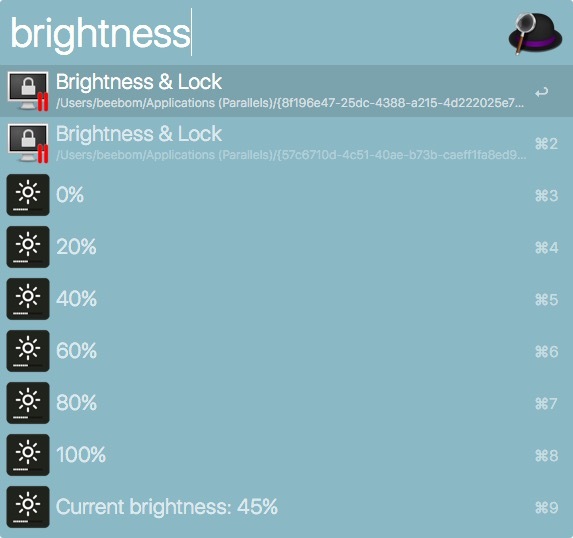 Alfred will display some common values that you may want to set, as well as the current brightness percentage. You can also explicitly mention the value of brightness you want, for example, you can type “brightness 39“. This will set your brightness to 39% of its maximum value. There are a number of occasions where you may need to shorten a url. Fortunately, you can easily use an Alfred workflow to directly shorten URLs using “goo.gl”, and copy the shortened URL to your clipboard. Simply launch Alfred, and type the keyword “goo.gl”, followed by the URL you want to shorten. Alfred will automatically shorten the URL, copy it to your clipboard, and send a push notification telling you that the work has been done. I like using QR codes a lot. Which is why this particular workflow, is one that I’ve used extensively. 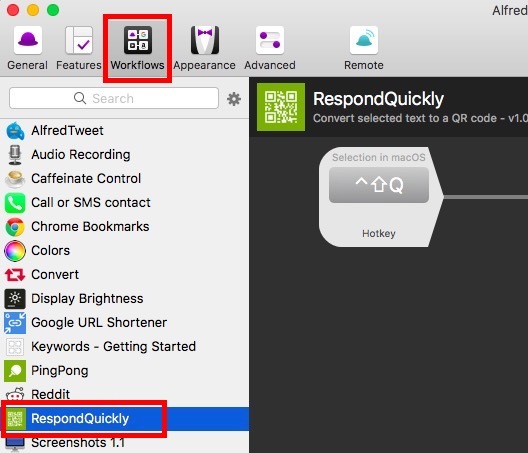 With this workflow, you can simply select any text, and press the workflow hotkey to automatically convert the text into a QR code. Go to Alfred Preferences, and under the “Workflows” tab, select the workflow titled “Respond Quickly”. Double click on the “Hotkey” icon, and choose the hotkey you want to use. I’m using “Shift + Ctrl + Q“. Now, simply select any text, and press the hotkey. 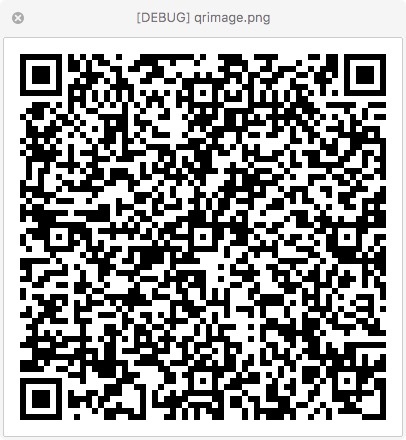 Alfred will then convert the text into a QR code, and save it on your Mac, so you can easily share it. Another really great workflow that you may find useful, is Simple Timer. This workflow lets you set a timer, along with a custom message to be displayed when the timer ends. When the timer ends, the message is displayed as a notification. In Alfred, simply type the keyword “timer” followed by the time, and then the message. If you want to specify the time in seconds, you can use something like “timer 5s bing!”, you can use “timer 5m bingbing” to set a 5 minute timer, and “timer 1h wake up” to set a timer for an hour. When the timer ends, the message you provided will be displayed to you, and will stay in your notification centre. If you like sending a lot of GIFs to your friends, chances are, it’s getting difficult to look for good GIFs. This is where “Alphy” comes in. The workflow allows users to quickly search for GIFs, and saves the link in your clipboard. Simply launch Alfred, and type the keyword “gif”, followed by the kind of GIF you’re looking for. Alfred will look up the search string in GIPHY, pick out a random one, and save the link to your clipboard, so you can easily share it. One of the most used features of Spotlight, for me, was its ability to perform conversions in a jiffy. However, this is one thing that Alfred can’t do, right out of the box. Fortunately, you can use Alfred to perform conversions, with this handy workflow called “Convert”. If you want to convert 1 metre into inches, you’d write “conv 1m in“. If you want to convert currencies, you have to use their currency codes. So, if you want to convert $100 to Pounds, you’d write “conv 100 USD GBP“. These were 15 of the best Alfred workflows that you can use to enhance your productivity on a Mac. There are a lot of other workflows that you can use, and you can even create your own workflows, if you want to. Creating custom workflows gives you the ability to tailor them perfectly according to your needs; and, if you’re proud of what you’ve created, you can even share them with the Alfred community. So, have you ever used Alfred workflows to get more productive on your Mac? What workflows do you use the most? Also, if you know of any other great workflows that you think deserve to be on this list, do let us know in the comments section below.